Wednesday, July 4, 2018 Mark your calendars, folks! There's a new RTS game in town! 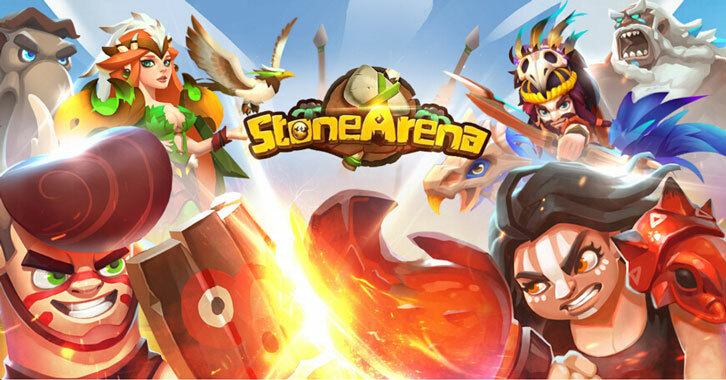 Publisher 37Games recently announced their new RTS mobile game Stone Arena. Developed by Gametopia and coming in July to Google Play and the App Store globally, Stone Arena will give players all around the world a legit RTS gaming experience on smart devices. The 3v3 brawler embraces user-friendly design as well as hard-core gameplay and strategy. To win a match, players will need to destroy the opponent’s fort in an arena-like battlefield. Battles can be intense, fast-paced and fun, but never easy. Deploy your units and use your skill wisely to defeat the formidable enemy in the adrenaline-pumping battle! Time is important in Stone Arena, because if you fail to defeat your opponent within 3 minutes, your fort (and the opponent’s fort of course) will be under sudden death’s hell fire attack until its HP drops to 0! So, there's no point playing the long game - don't hold back and unleash your full might on your enemy right from the start! Tina the Siege Master, Diego the Bio-Tinkerer, Avina the Shamanic Beauty… Every hero in Stone Arena has their own unique skills. Choose your hero and team up with your friends to form an invincible team. Unlike most MOBA games where heroes are often bound to a limited amount of equipment, heroes in Stone Arena can synergize with each type of unit to create lineups of endless possibilities. Your opponent may use Tina the Siege Master, but you can never be certain about their exact strategy! Oh and don’t forget to delve into their interesting back stories! Each hero and unit comes with its own unique backstory or anecdote. You may also want to pay attention to the details of each unit, expand your knowledge and become a master of battles. A cannon that shoots watermelon seeds, a young lady that uses a lobster pincer as a weapon, and a monkey that throws his banana like a boomerang…The creativity never stops! As the official global launch of Stone Arena draws near, are you ready to join the fray? A brand-new RTS experience awaits!